•Experience has shown that very small polylines, usually comprising of two vertices can sometimes be digitising errors. Such errors tend to occur in river networks showing the grid like patterns of managed water ways. •Below is an image where a two vertex polyline of less than 1m in length (green) has been identified by RivEX. •This does not invalidate the topology of the network and could be left in. 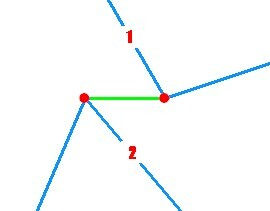 In reality the polylines marked 1 and 2 should connect to each other at a single node as there is no Z bend. •You could delete this polyline and snap the other polylines to one of the nodes.